Solve force and motion problems. Change parameters of physics factors. Gain experience with and learn social emotional skills. Learn how to solve force and motion problems. Draw analogies between force/object interactions and people/people interactions. A change in the position and motion of an object is a result of the manipulation of forces acting on an object. Change in the behavior of a person is the result of the interactions with the person. The concepts covered in GVG can be coupled with both science and mathematics curriculum. GVG maps onto the Next Generation Science Standards (NGSS) (NSF, 2013). 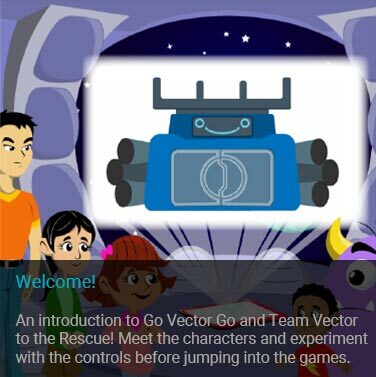 The game mechanics in GVG are consistent with the Performance Expectations K-PS2-1, K-PS2-2, 3-PS2-1 and MS-PS2-2, covers the NGSS Disciplinary Core Ideas Forces and Motion, Energy, Defining Engineering Problems, and requires the use of the Science and Engineering practices contained in Table 3. Resolving and de-escalating observed bullying conflicts. Responding appropriately to scenarios depicting children in problematic situations. 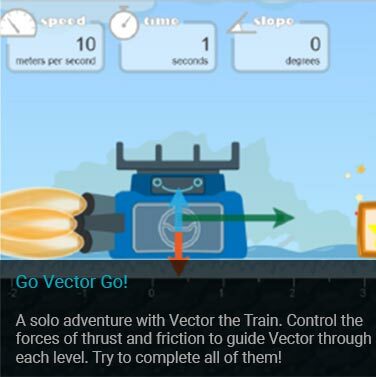 Manipulating physics components (i.e., force, friction, motion, mass and slope) to ride Vector the train to reach the children needing their help. Problem-solving what physics parameters will get them to the children the fastest. 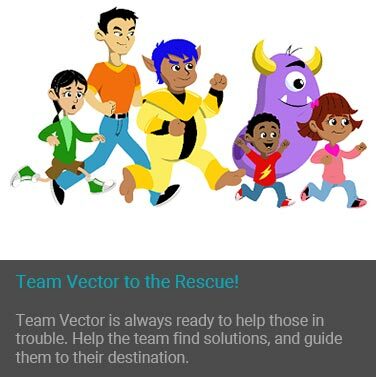 Team Vector to the Rescue was tested with 117 students from grades K-5. Students showed significant improvement after only 30 minutes of gameplay. K-PS2-1 Plan and conduct an investigation to compare the effects of different strengths or different directions of pushes and pulls on the motion of an object. K-PS2-2 Analyze data to determine if a design solution works as intended to change the speed or direction of an object with a push or a pull. 3-PS2-1 Plan and conduct an investigation to provide evidence of the effects of balanced and unbalanced forces on the motion of an object. MS-PS2-2 Plan and conduct an investigation to provide evidence that the change in an object’s motion depends on the sum of the forces on the object and the mass of the object. Asking Questions and Defining Problems Asking questions and defining problems in grades 3-5 builds on grades K-2 experiences and progresses to specifying qualitative relationships. Ask questions that can be investigated based on patterns such as cause and effect relationships. Define a simple problem that can be solved through the development of a new or improved object or tool. Planning and Carrying out Investigations Kindergarten.Planning and carrying out investigations to answer questions or test solutions to problems in K-2 builds on prior experiences and progresses to simple investigations, based on fair tests, which provide data to support explanations or design solutions. With guidance, plan and conduct an investigation in collaboration with peers. 3rd grade.Planning and carrying out investigations to answer questions or test solutions to problems in 3-5 builds on K-2 experiences and progresses to include investigations that control variables and provide evidence to support explanations or design solutions. Plan and conduct an investigation collaboratively to produce data to serve as the basis for evidence, using fair tests in which variables are controlled and the number of trials are considered. Make observations and/or measurements to produce data to serve as the basis for evidence for an explanation of a phenomenon or test a design solution. Analyzing and Interpreting Data Analyzing data in K-2 builds on prior experiences to collecting, recording, and sharing observations. Analyze data from tests of an object or tool to determine if it works as intended.